One of the world’s best loved safari destinations by day, Etosha National Park also offers a range of overnight wilderness experiences, both inside the park and nearby, to thrill every visitor to this enigmatic place. Of the 5 overnight camps available to choose from within the boundaries of the National Park, three have onsite waterholes for 24-hour game viewing, and all of them offer guided night drives in the care of knowledgeable professional game rangers. The main camps at Etosha offer self-catering accommodation and camping facilities with braai facilities, as well as onsite swimming pools, restaurants, shops, petrol stations and floodlit waterholes. When visiting these camps it is advisable to take all your own food, cooking and eating utensils, as the shops provide only basic provisions. Okaukuejo is the busiest and biggest camp in Etosha, the administrative seat of the park, and an important research station, found just 17km from Andersson Gate in southern Etosha. The camp was initially set up in 1897 as a fortified military outpost, and first opened to the public in 1955. Here you will enjoy sightings of the less common species such as the rock monitor as it gorges itself on the hatching mopane moths, or a lion hunting at the floodlit waterhole and other game in the surrounding areas. Premier bush chalets overlooking the waterhole, standard bush chalets, double rooms and camping facilities are offered at Okaukuejo. Situated among the Helio Hills, Halali camp was once a signal station but today is better known as one of the best places to spot leopard in Etosha, being located in the only hilly landscapes open to the public. Halali is surrounded by the most popular waterholes in the Park and a high concentration of game, especially elephant and rhino, is found here. At Halali, you can choose between camping with communal ablutions, double hotel rooms or bush chalets comprising either two or four beds. Sightings of leopard are almost guaranteed for those with enough patience to wait quietly at the floodlit waterhole located just a short walk from camp. Halali camp is found half way between Okaukuejo and Namutoni. The first Europeans to discover Etosha, namely John Andersson and Francis Galton, originally camped at the site of Namutoni, and it has also served as a frontier post with Owamboland, as a control centre during the rinderpest epidemic and as a German fort. The fort is the hub of the camp, with an elevated walkway overlooking the waterhole and all the onsite facilities centred here. You can make yourself at home in large two bedroom chalets, double rooms or camp sites while visiting Namutoni. Located close to the famous Fischer’s Pan, Namutoni is a fantastic destination for birdwatchers. Namutoni is situated in Eastern Etosha and close to the Von Lindequist Gate. The newer, smaller camps boast wonderful scenery, exclusive experiences, luxury accommodation, five star dining and superb service. 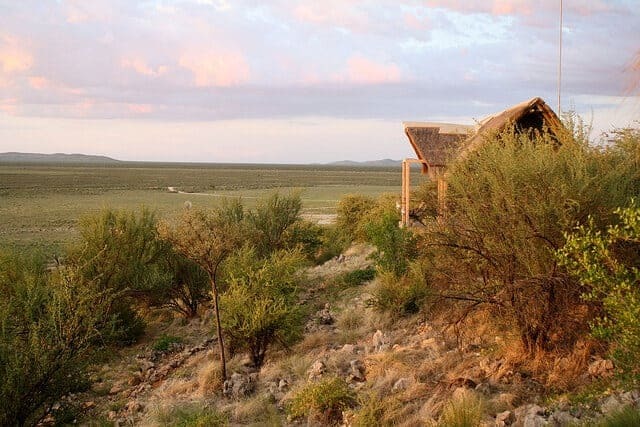 Opened in 2010, Dolomite camp is secluded in the restricted Western section of Etosha. This area was previously used as a breeding centre for endangered species and is open only to selected tour operators and their guests. The rare Hartmann’s mountain zebra and black-faced impala are resident in the surroundings of Dolomite camp, while elephant, rhino, leopard, springbok, gemsbok and red hartebeest thrive among the many waterholes here. Accommodation is in just 30 luxurious permanent safari tents overlooking Etosha’s vast plains, with all meals included. You reach Dolomite Camp via Galton Gate, which is accessible only to those with a reservation at this exclusive property. The most recent addition to Etosha’s accommodation offerings, Onkoshi Camp is found on an isolated peninsula on the edge of Etosha Pan in the north eastern reaches of the park. Access is restricted and guests at Onkoshi are chauffeured to their accommodation from Namutoni Camp. Sublimely isolated, Onkoshi can accommodate just 30 guests in luxurious, canvas-walled thatched suites, with breath-taking views over the park and all meals provided. If you would like to spend some time in this unique destination, please contact us for assistance in organising your Etosha National Park safari, and watch this space for more information on where to stay in the area.